Fabulous Downtown PC Private Luxury Home Mtn Views Ski in/ Walk to Main Street! Enjoy this awesome custom luxury 4 bedroom home, located two blocks above Main Street and walking distance to ski runs and the town lift at Park City Mountain! Nestled on the Mountain with beautiful views, designer furnishings, a gourmet kitchen and great room not to mention the stone terrace with private outdoor spa! Two minutes to great restaurants, shopping, Deer Valley, and The Canyons. This 2500 square-foot home has a large beautiful quartz entry way with custom millwork and built-ins for all your gear! A cathedral ceiling library opens to large deck overlooking downtown Park City. Pullout sofa, full bath and mountain decor complete this stunning, private retreat area. An artist designed staircase leads you to the great room with beautiful stone fireplace, built-in entertainment center and state of the art gourmet kitchen with marble counters. Dining for 8 and island seating as well! This floor also has a queen sized master bedroom with limestone bath, and a log furnished bunk room. SUMMER RENTERS please note: this home, like 95+% of homes in Park City, does not have central air conditioning. It does, however, have two portable AC units that are currently set up upstairs and in the kitchen/dinning room area. There is almost NEVER a need for AC but in the past couple of years there have been about 10 scattered days in July where it is a very nice feature to have. The portable AC units do a fantastic job but please never switch to 'ac' mode on the main thermostats. The Owners are an active East Coast family of skiers, golfers, mountain bikers, climbers and art lovers who truly enjoy the unique and wonderful atmosphere of Park City, year round! Managed by AllParkCityRentals, a small boutique Park City property management company, this home offers luxury, attention to details, and personal attention not found at larger rental companies. Location, location and the Charm of 'Old Town'! The proximity of Salt Lake City airport only 45 minutes away makes it a very easy trip any time of year. 3 full bathrooms with showers, 2 with tubs. master bathroom has steam shower and jacuzzi extra large separate bath. PLEASE NOTE: THIS HOME DOES NOT HAVE CENTRAL AIR CONDITIONING. THERE ARE TWO PORTABLE UNITS THAT WORK WELL THAT CAN BE MOVED AROUND to different rooms. There is a garage that can fit a SMALL suv and one parking space in the driveway. You do NOT need a car at this location. if you do bring a car, there are spaces for two cars MAXIMUM. One car - No large SUV's in garage. Total of 2 (two) parking spaces at this home. This home is a beautiful luxury home but is built into the mountain with lots of stairs. A wheelchair would not be able to access the main level with the kitchen, nor anywhere else in the house other than the entrance level. 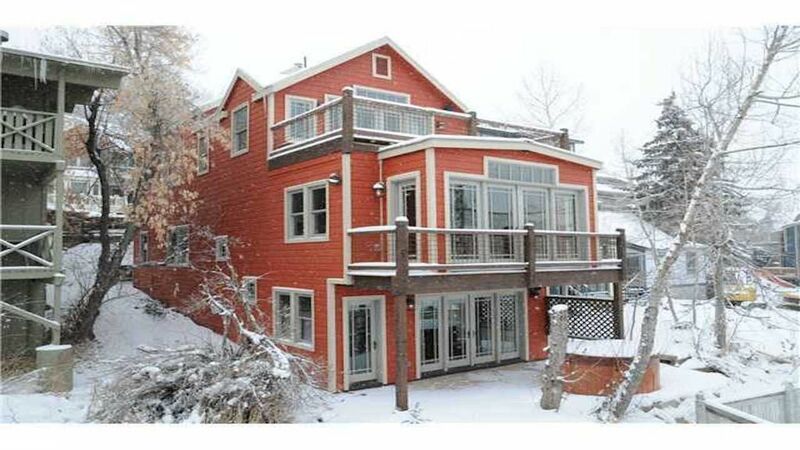 Located on stone patio overlooking Park City. Outside is a private stone patio with hot tub. All rooms have flat screen TVs. Wifi, DVD, Stereo system, and surround sound in great room are a few of the many amenities provided. Kitchen includes Wolf cook top,Sub-Zero frig, Bosch quiet dish washer; wine refrigerator and micro-wave in center island. Staircase to ski run across street. Loved the house! Location to slopes and downtown were great. Renters need to be aware of stairs ... to get downtown and the ski in/out access. Thanks so much for your review and so glad you loved the house. I don't advertise the home as ski in/out but glad you thought it was! Hard to have a home so close to everything in the mountains that is so close to ski in/out without having some hills/steps! Main street is located just down the hill but you have to go down (and then back up) two sets of stairs/steps. To get to the ski slope, you have to walk about 1/2 block and up about 10 stair steps. But overall, just about the best location possible for skiing and exploring Park City Main street and Old town! We thoroughly enjoyed our stay. The location was terrific. One suggestion is to upgrade the pillows. Thanks for choosing this home and so glad you loved the location. First I've heard of the pillows but that is a very easy 'fix' and I will have new onew for you for your next visit. Location is great- just a few blocks to restaurants and shops. Loved the location, close to town and a couple of blocks for slope access. Quit in Time is a blue but can be a bit tricky if not groomed. The den did not have two couches but there were some air mattresses so we made due. Overall a great house. Great house for a family vacation! We had such a great time at this house with 3 generations of our family together for a ski vacation. The house is set up so everyone had their own space yet we could all be together in the kitchen/living room/dining areas. We enjoyed being able to walk into town. The owner, Patti, is extremely responsive and helpful. Location is the best. Next to the 4th Street stairs for town and a short wall to the 5th street stairs up to the snow. Got together with college buddies for 30th reunion and the living room was perfect for hanging out. 6 burner gas stove is perfect for big breakfasts. Patti is very organized and super-responsive. Highly recommended. * NO CHECK ins allowed on Christmas day/evening (12/25/16). If you make a reservation to start a stay on Christmas, you will not be able to check in that day. Please DO NOT MAKE A RESERVATION REQUEST THAT STARTS ON CHRISTMAS DAY. * IF you are using a NON-USA (international) credit card, you will receive an additional invoice for a 1.5% processing fee which must be paid prior to receiving check in details. * NO REFUNDS for cancellations or any kind during Sundance or Holidays All other cancellations made at least 45 days prior to arrival will receive a full refund minus a $300 processing fee. - cleaning/reservation fee charged for each stay -Non-smoking - Pets are allowed at this home with references and checking the 'pet fee' option during check out. -Daily cleaning available for an additional charge -Check-in 4:00 pm - Check-out 10:00 am Early / late check ins and outs may be available but must be approved IN WRITING before arrival. the locks on this home are set electronically by time and date so please be mindful of the times.